I recently sat down and had an “open” conversation with Arun Iyengar, The Semiconductor Guy, to get his views on the impact of open-source processors, and explore what motivated him to take on the VLAB role of Program Co-Chair and lead of the September panel. The growing number of projects in the internet of things and the artificial intelligence domains drives the demand for custom solutions in the semiconductor industry. A variety of applications require specialized system-on-a-chip designs that can deliver the performance needed for certain tasks. This month, VLAB panelists will discuss how the open-source approach to developing new processor technologies is impacting the world and can help fulfill this demand. Previously, open-source has lived exclusively in the software domain. Two examples that get a lot of industry buzz are GitHub and Linux. The panel Arun is coordinating, titled “Open-Source Processors: Bringing Silicon Back to Silicon Valley”, will take place September 18th at Stanford Faculty Club. Here’s what he had to say during our Friday afternoon conversation at the Big Basin Cafe in Saratoga. Michelle: I understand that open-source is affecting hardware in a big way. What are the implications? Arun: Today’s processor is mostly defined by two big tech companies. (Hint: Their names start with an “I” or “A”). With open-source processors, there could be faster product development — meaning products that get to market more quickly — better security and production that’s much cheaper. Michelle: What’s a notable open source processor use case? Are these in current or future products? Arun: It’s in storage. Western Digital is talking about shipping open source processors as early as next year. Note that an open source processor is different than open source hardware. Michelle: What was your first VLAB experience like and why did you decide to take on a panel chair role? Arun: My first event was on deep learning and the second focused on self-driving vehicles. I then met Ravi (Prasad) at the second event. Given my semiconductor background, I was interested in showcasing the hardware necessary to make all sorts of interesting things such as machine learning, autonomous driving etc possible. I enjoy the diverse topics that VLAB explores, all with the common theme of finding approaches or companies that disrupt the status quo. Michelle: By the way, congratulations on the new Program Co-Chair role with Ravi! Here’s the next question. Are new business models developing because of open source processors? Arun: Thanks, Michelle. Recall Linux replacing Unix through offerings from companies such as Red Hat. Now companies will become the Red Hats of open-source processors, or use open-source processors to create domain-specific products. Michelle: Your MBA came from Carnegie Mellon: What was it like going to school there? Michelle: What’s your philosophy of life and/or work? Arun: Do things you enjoy. If you don’t like what you’re doing it doesn’t matter how much you get paid. Move on. 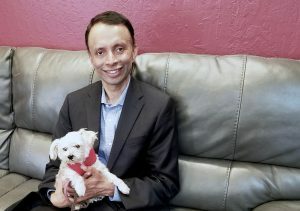 Mr. Iyengar, a resident of Saratoga, California, is a former Silicon Valley semiconductor company executive, and current business consultant and real estate investor. This story is by VLAB blogger Michelle McIntyre, a Silicon Valley publicist and consultant. She’s @FromMichelle on Twitter. Please follow @VLAB on Twitter as well.